Part 3 of the 10-Days-Special on Australia will be on another part of Sydney: The Rocks. I’ve been there many times and took several people sightseeing when they came and visited. If you only have a few days in Sydney you should spend at least half a day at The Rocks, preferably on the weekend. You could either spend half of the day shopping in the CBD, walking through the Botanic Garden or taking a guided tour in the opera. Or you head to the other side, to Darling Harbour and the explore that part. But maybe you just start with the Rocks and see what the day brings. From Sydney’s CBD, the city center, it is not far to The Rocks. This is an area that borders the harbour and goes as far as the Harbour Bridge and the Opera is just opposite of the ferry station Circular Quay. Best take the tube to Circular Quay and start here. It used to be a rather poor working class area. Saved in the 1970s from demolition, it is now a place to step back in time a little bit. If you have a walk around you’ll notice all the old houses and pubs. There is even an old shop kept the way it used to be. 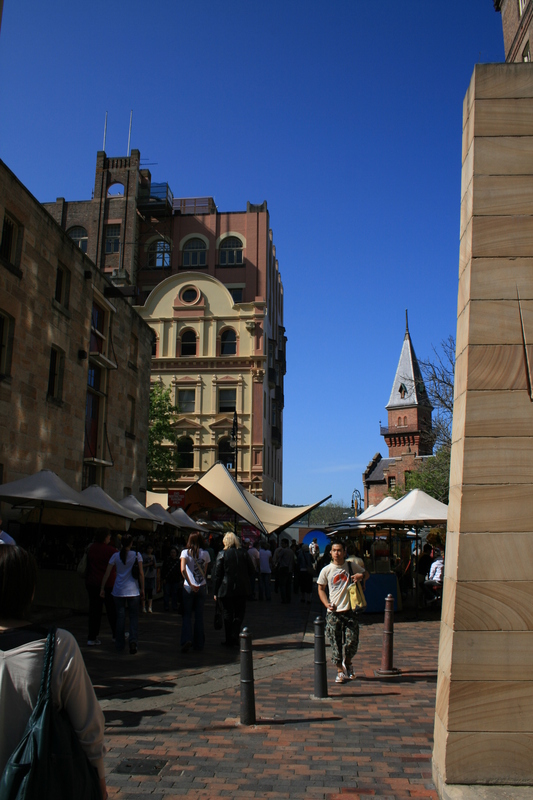 And on the weekends you’ll find a street market here as well: The Rocks Market. 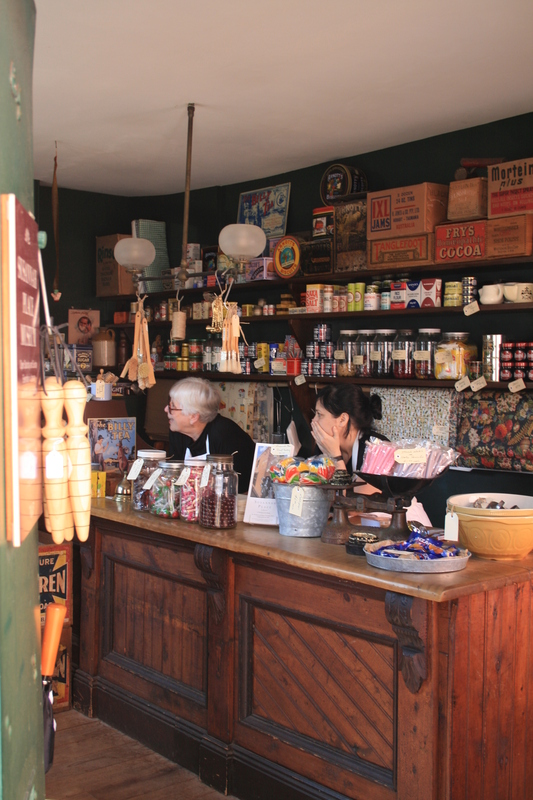 For an afternoon treat you could slip in from the street market to The Tea Cosy, an Irish shop and tea room with wonderful scones. You should of course have a look at the Harbour Bridge. You can do a tour and really climb it. But to be honest, I’m a bit afraid of heights, especially when I can’t hold on to something solid. I went up on one of the pillars of the bridge though. If you want to know something about Sydney’s and The Rock’s beginnings, than go to the The Rocks Discory Center, entry is free and it gives you a quick inside on the history of this playe before you do more sightseeing or shopping on the market. And when you are around, then make a reservation for the evening in the restaurant around the corner of the museum, The Pony. It is a cool place to eat and the food was always good, something that doesn’t seem to have changed as my parents told me who went there last year again. If the weather is nice you can even sit on the little balcony and enjoy the old brick and sandstone buildings of The Rocks. After dinner at The Pony, you could walk towards Harbour Bridge. Here you’ll find the Harbour View Hotel. In this case this bar is really also a hotel, which is not usually the case. 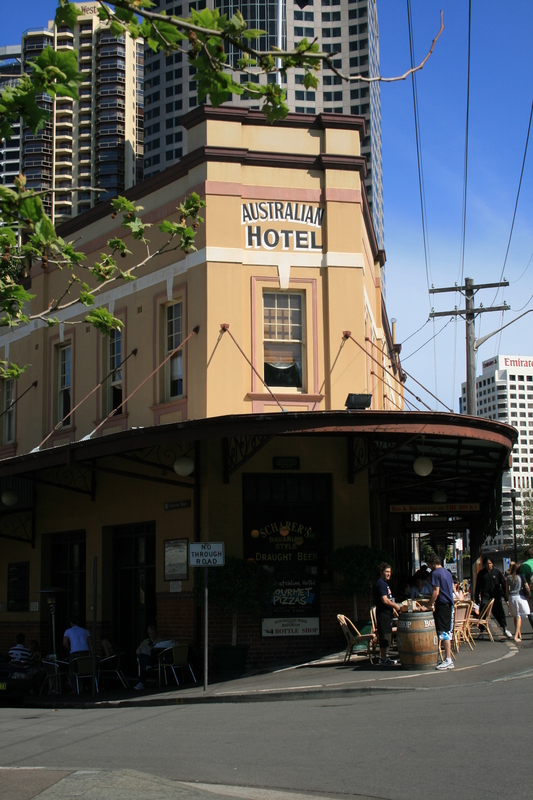 Many venues in Australia are called hotel when they are just normal pubs or bars. The reason dates back to late nineteenth century when, after pressure from conservative Christian groups new liquor legislation were implemented forcing pubs to also provide accommodation. In any case, Harbour View Hotel is the place to sip a cocktail while sitting half under the bridge. Otherwise you can also go up the Shangri-La Hotel to the BluBar on 36. It is open to the public and you have a magnificent look all over Sydney or party at The Argyle (have a look at the party pictures here for a good idea on the current fashion in Sydney… I sometimes wish, people would dress up that much in Germany too. I like dressing up for parties). Also around the corner is the Old Sydney Holiday Inn. 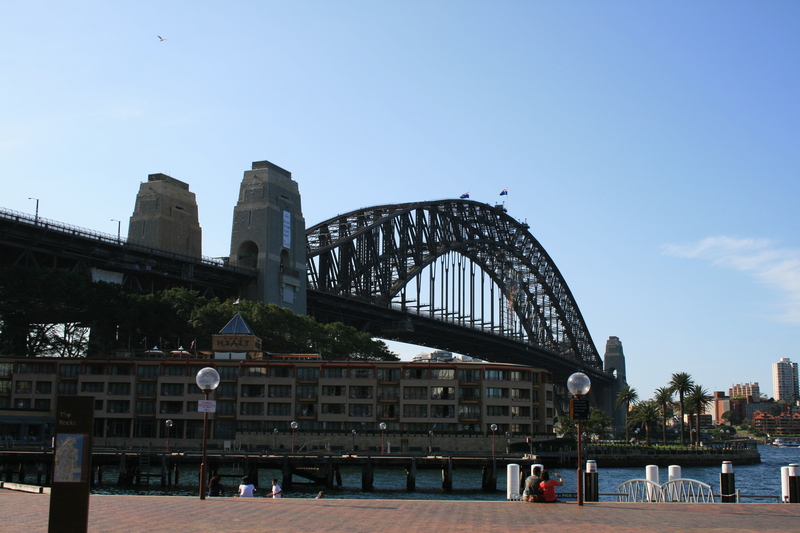 If I should come back to Sydney I would like to stay there as I always looked at it when coming over the harbour bridge. It has a pool with harbour bridge view and a view of the Opera. Check out what else you could do in Sydney here. This entry was posted in Australia and tagged History, Museum, Sydney by kathatravelling. Bookmark the permalink.